Magnetic Bar Field Model to rename to Ejs Open Source Bar Magnet & Compass Model with Earth visualization java applet as request by one of the authors. special thanks to Fu-Kwun Hwang for mentoring this learning community. This now has great features, thanks to Wolfgang Christian, Francisco Esquembre, and Anne Cox for sharing their original applet, special thanks to Fu-Kwun Hwang for mentoring this learning community, support the development of this new and improved Ejs Open Source Bar Magnet & Compass Model with Earth visualization java applet. This material is re-released under the GNU General Public License Version 3. http://www.gnu.org/licenses/gpl.html as legally required by the original authors. The EJS Magnetic Bar Field Model shows the field of a bar magnet and has a movable compass that reports the magnetic field values. The bar magnet model is built by placing a group of magnetic dipoles along the bar magnet. Users can examine and edit the model if Ejs is installed. 1. Run the simulation. Move the compass around in the magnetic field of the magnet. Move the magnet around. What is the relation between the compass and the field vector (small arrows)? 2. Test to see how well you can use the compass to determine the location of the magnet: Click on the Randomize position check box and then push the Hide Field button. Use the compass to show the direction of the magnetic field and then move the marker (same size as the magnet) to where you think the magnet is located. Click on Show Field to see if you were correct. If you were, describe your strategy. If you weren't, explain what went wrong and try again. 3. The model uses a group of magnetic dipoles to build a model of a bar magnet. If you have Ejs installed, examine the model and determine how many dipoles are stacked together (and in what configuration) to create a model of a bar magnet. * Giancoli, Physics for Scientists and Engineers, 4th edition, Chapter 27 (2008). The Magnetic Bar Field Model was created by Wolfgang Christian and Francisco Esquembre and modified by Anne J Cox using the Easy Java Simulations (EJS) authoring and modeling tool. Exercises written by Anne J Cox. You can examine and modify a compiled EJS model if you run the program by double clicking on the model's jar file. Right-click within the running program and select "Open EJS Model" from the pop-up menu to copy the model's XML description into EJS. You must, of course, have EJS installed on your computer. 1.Predict the direction of the magnet field for different locations around a bar magnet and electromagnet. 3.Identify the characteristics of electromagnets that are variable and what effects each variable has on the magnetic field’s strength and direction. 17 change the evolution equation to domega/dt = -k*getB(xCompass, yCompass)*(Math.sin(deltaTheta))-damp*omega so that the motion of the compass depends on the B strength at the location of the xCompass, yCompass. [/s] by applying the transformation to the dipoles as well. 33 setup the dipoles perfectly to achieve symmetry in reading of B. 21 appears to have a runtime bug http://www.phy.ntnu.edu.tw/ntnujava/index.php?topic=1576.0 if you move the compass like mad very quickly sometimes it cause a ArrayIndexOutOfBoundsException: 20 error. things i want to do but can't figure out yet. a flip magnet simulation possibility DONE! better color for the rombus <> blue and red instead of the current teal and red. [/s] DONE! I have written down here what I learnt and made the original applet into a learning object that I would use. u can do it 2 , and it is really fun, but tough fun. *** There are 8 more attached files. You need to login to acces it! 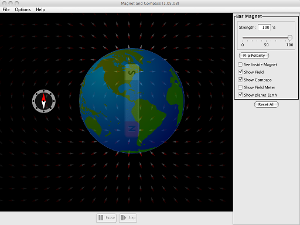 Ejs Open Source Bar Magnet & Compass Model with Earth visualization java applet. Attached are the pictures of the last remix and the powerup rotation remix thanks to Prof Fu-Kwun Hwang.